Frogs are not noted for having much of a family life, and as adults many of them are solitary animals. If others of their species live near them, they may tolerate one another without having much interaction. If the others are small enough, some types of frogs may even eat them. 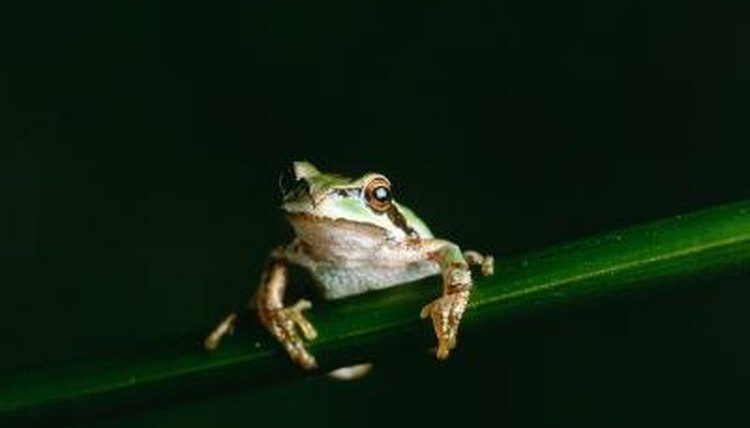 In many species, such as gray tree frogs, the males become territorial around the breeding season and may fight with other males while seeking the company of receptive females. During the breeding season, the male frogs call to the females using a variety of croaks, tweets and bellows, depending on the species. The male uses these sounds to attract a female that he hopes to entice to breed with him. Some species, such as the gray tree frog (Hyla versicolor) may carry on for weeks before actually getting down to the business of mating. Others, like the southern leopard frog (Rana sphenocephala) mate often during the breeding season, producing hundreds of fertile eggs each time. Amplexus describes the process most frogs use when breeding. If the female likes what she sees and hears prior to mating, she’ll be receptive to the male and allow him to climb on her back. He then wraps his front legs around her middle and holds on tightly while she lays her eggs, often directly into the water. He may help squeeze the eggs out by tightening his embrace. He releases sperm as the eggs appear, and they are fertilized externally. The male and female frog remain together only a short time during amplexus, typically about 20 minutes. This short amount of time includes their initial meeting and the time used as the male mounts the female, as well as the time it takes for her to expel all of her eggs and for the male to fertilize them. It’s possible that the two frogs will breed again, but most likely not to each other. Frogs don’t stay together to raise their babies and usually split up right after breeding. They may dive into the water and swim away or simply hop away into the nearby fields or woods to rest. If any care is given, it’s normally the female frog that does it. She may attach her eggs to underwater plants or other items to protect them until they hatch. When the tadpoles emerge, they leave their eggs and anchor themselves in a new spot until they can take care of themselves. In a few species, such as the poison dart frog, the females abandon the eggs but the males stay close and protect them until they hatch. Herpetology, Fourth Edition: An Introductory Biology of Amphibians and Reptiles; Laurie J. Vitt, et al.